Research In Motion's new BlackBerry Torch is sure to stoke the fires of envy in the crackberry crowd, but how does it compare to Android and iPhone? Are you a BlackBerry addict? Is BlackBerry Messenger your life? Do touch screens turn you on? 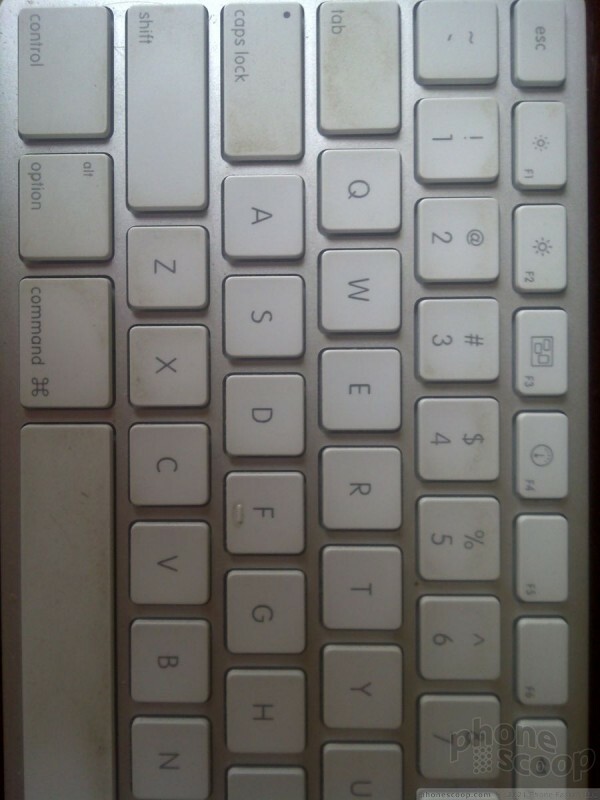 Do you need a physical keyboard for typing messages? 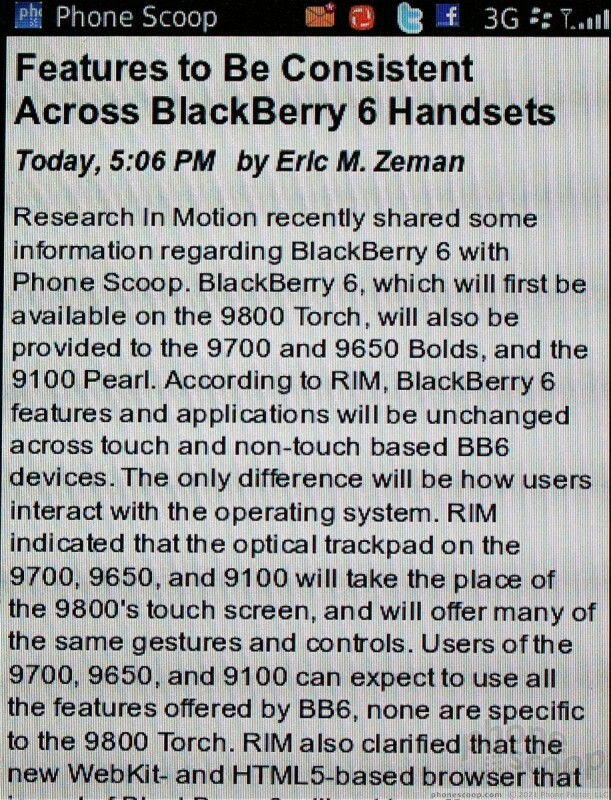 If you answered yes to any of these questions, than it's likely Research In Motion's latest BlackBerry, the 9800 Torch, is right up your alley. The 9800 pairs RIM's strengths — those keyboards! that email! BBM! — with a new operating system and a slick new hardware design. The Torch's screen measures 3.2 inches and offers a measly 360 x 480 pixels. It's certainly not a bad display, but after using high-resolution displays from RIM's competitors, it is hard to be excited about 360 x 480. Most icons, menus, and images look decent. Some rough pixel edges are visible here and there, but they are by no means horrible to behold. Even small text is easy enough to read. As far as brightness goes, the display is easy to read indoors and outdoor visibility was surprisingly good. Reading emails, browsing the web, using the camera, sorting through menus was no problem at all under a bright, summer sun. The Torch performed well in signal tests. It consistently held onto one or two more bars than other AT&T handsets tested in the same spot. It survived a trip to my basement with no problems, as well as a trip into NYC and other areas around northern New Jersey. The Torch rarely dropped below three bars in the signal indicator, with it most often showing four or five. How does that translate to real-world performance? Favorably. I experienced no dropped calls, no missed calls, and data sessions were consistent. BlackBerry devices generally do well with signal performance and the Torch is no different. Sound was disappointingly inconsistent on the Torch. Call quality ranged all over, from bad to good. Some calls were crystal clear, others were horribly noisy and cut in and out. Earpiece volume was sufficient for most normal environments. I was easily able to hear a caller while sitting near a loud air conditioner, and while sitting in a busy coffee shop. 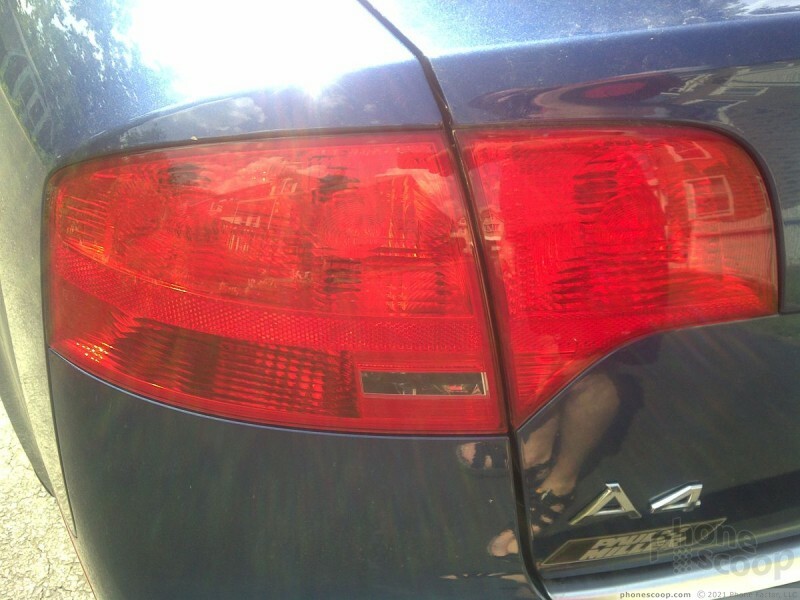 Car noise shouldn't be cause for concern. The speakerphone was just shy of loud enough. 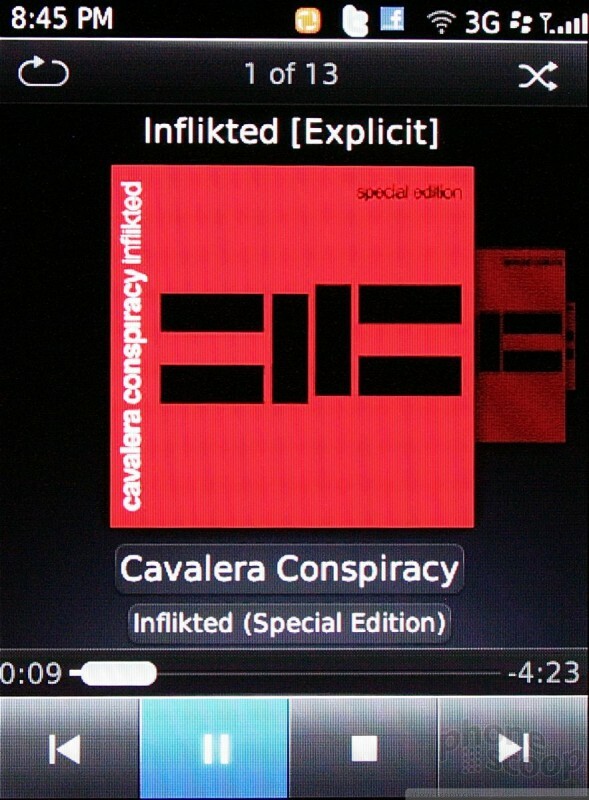 Even with the volume set all the way up, it was a bit quieter than I wanted it to be. The sound quality issues mixed with the almost-there volume force me to suggest you seek alternatives for the speakerphone if you have them available. RIM's co-CEO Mike Lazaridis is obsessed with battery life. That's one reason why BlackBerries traditionally perform well when it comes to holding onto a charge. In my tests, the Torch proves once again how Lazardis' devotion to power management pays off. The Torch easily lasted though an entire day with email, Twitter, and Facebook pinging it every few seconds. Phone calls didn't seem to dent battery life too much, nor did browsing the web. I was able to kill off a full charge in just over 31 hours. That was with heavy use. Those who use the Torch more sparingly — and leave out the social networking — might see two full business days of use. 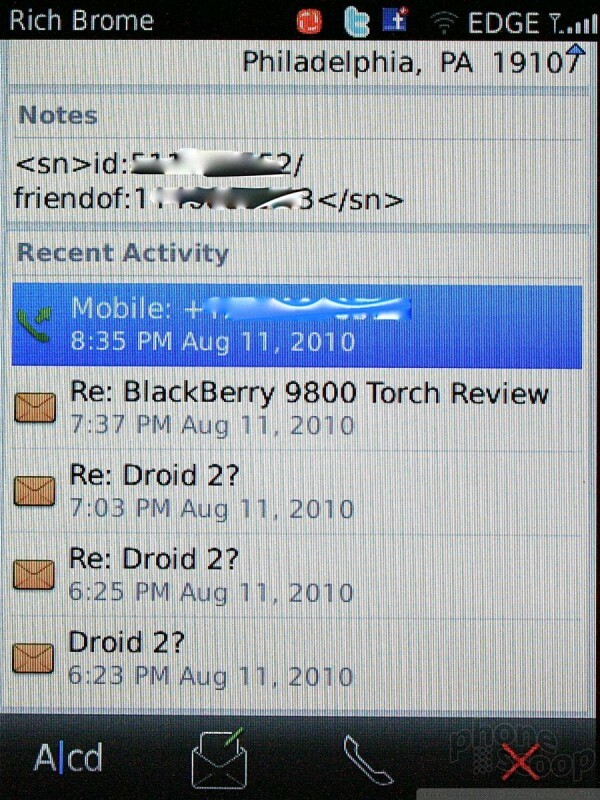 Making phone calls from the Torch is very similar to making calls from RIM's existing BlackBerry devices. Pressing the green send key opens the phone application. 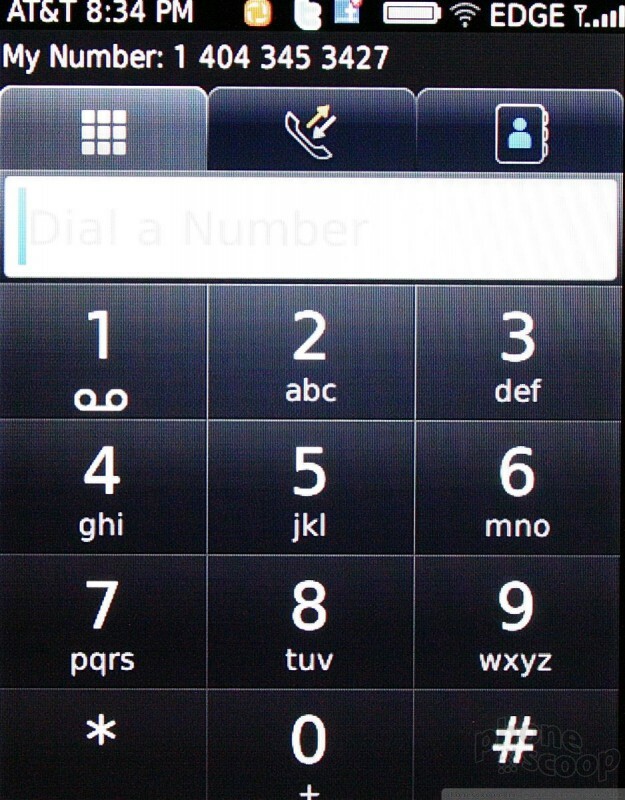 There are three tabs along the top for the dial pad, call log, and contacts. Whichever of these tabs was last open or used is the one that shows up when the send key is pressed. The software dialpad is huge. It's easy to work with and use. The call log looks almost identical to current BlackBerries, but offers a few neat tweaks. The best is that the press-and-hold gesture has been added to the call log. 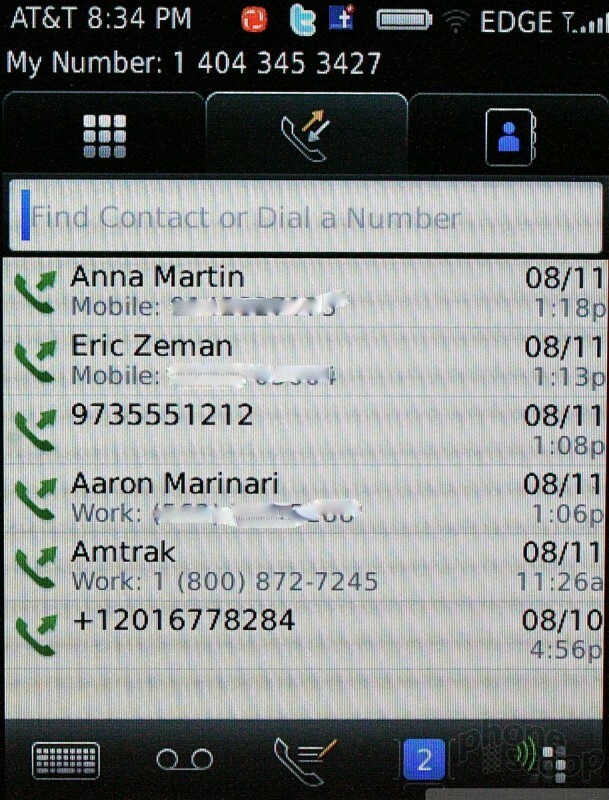 Press-and-hold a call log, and the Torch offers up an options menu. Pressing the BlackBerry key has the same effect. With a call in progress, the options presented to users are similar to what is seen on other touch devices, including quick access to the speakerphone, mute switch, and so on. 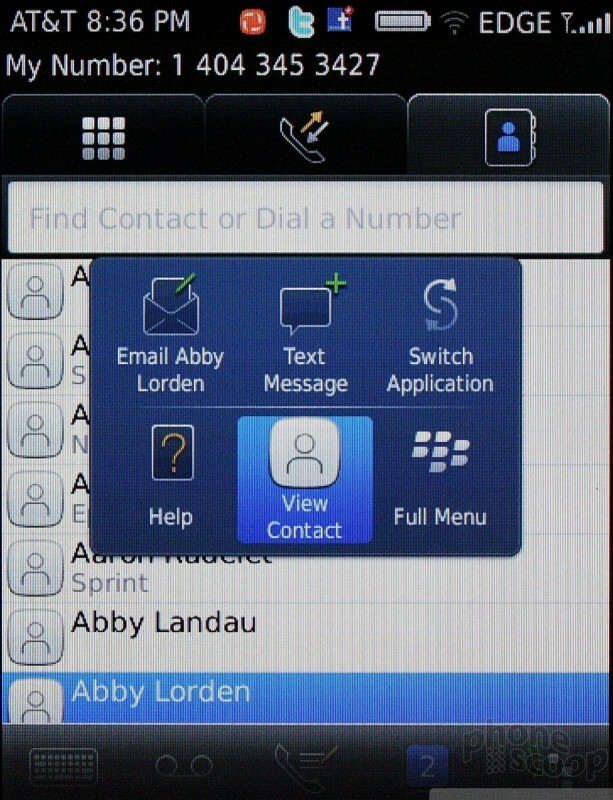 RIM made more changes to the contact app's behavior than the phone's, but the two are tightly integrated. As mentioned earlier, the Universal Search function alone adds a lot of power to the Torch, BlackBerry 6, and how users will interact with their contacts. Being able to type a contact's name from the home screen and go directly into a call or the contact app really speeds up many communication functions of the Torch. One thing it handles well is syncing Gmail / Google contacts. That will be a big deal for some users. Seeing recent communications when viewing a contact card is handy information to have. Knowing when you last called or emailed someone at a glance. Want to call them? Press their number. Want to email them? Press the email address. The contact app is supposed to cross-pollinate information with Facebook and Twitter, but I was unable to get this to work properly. For example, Facebook profile photos did not show up in my BlackBerry address book, despite their presence in the Facebook application. 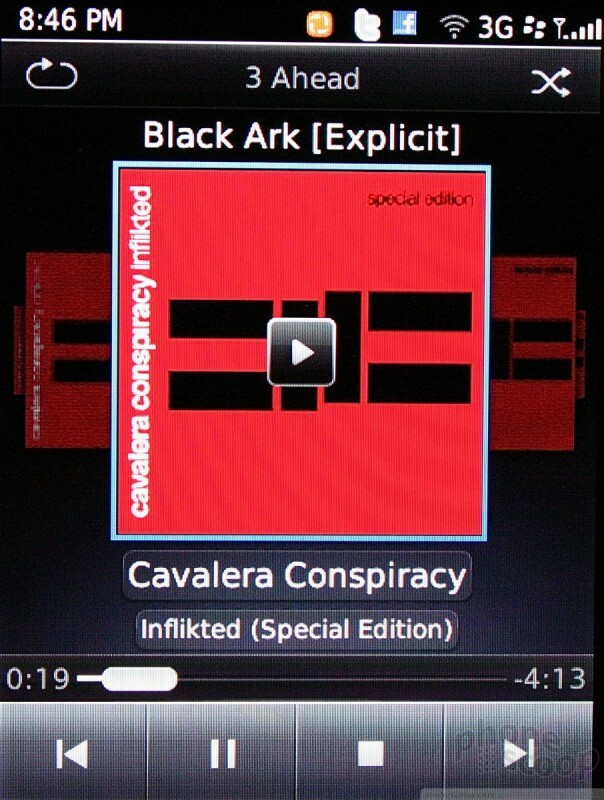 For the most part, however, RIM sticks to its guns with the calling and contacts apps. They are amazingly useful, and work together seamlessly as one in order to make interacting with calls and contacts as painless and easy as possible. 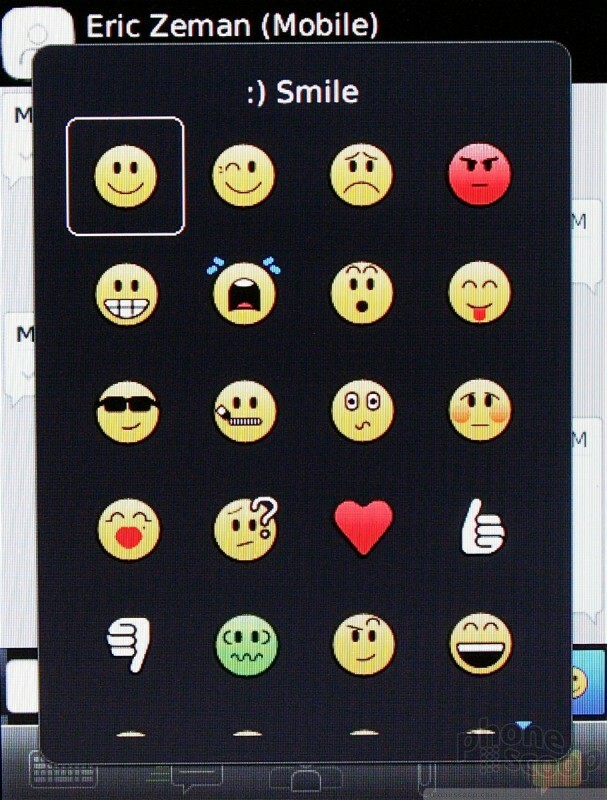 In case you forgot, BlackBerries are made for messaging maniacs. 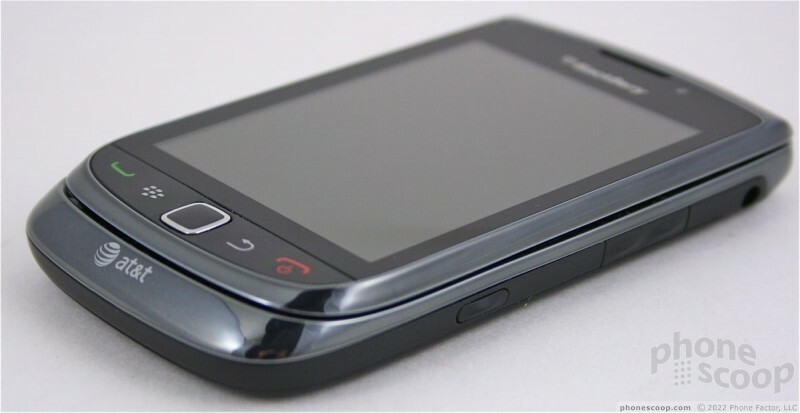 The Torch 9800 offers email, SMS, MMS, IM — in short, everything you'd expect. First up, email. 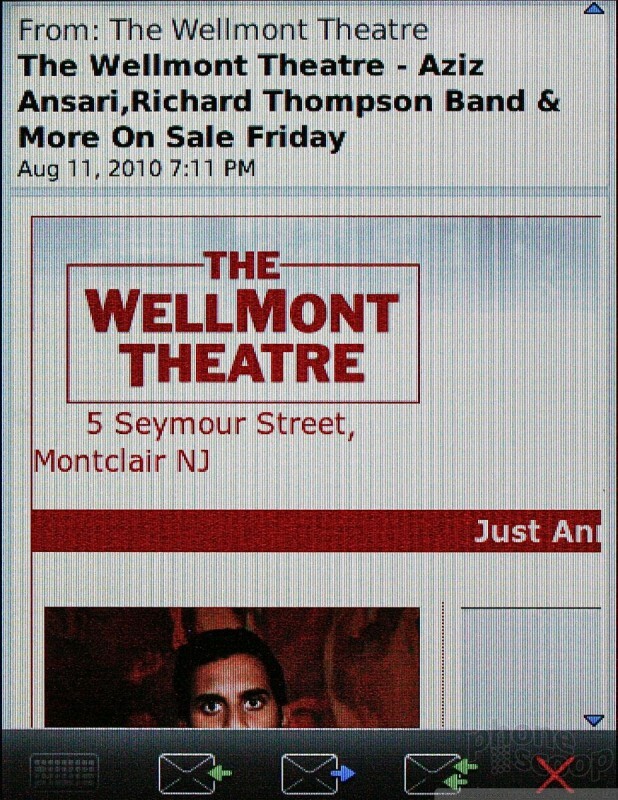 RIM has overhauled the email application a bit, though it doesn't go as far as I'd have liked it to. Whether you're a corporate user or a Yahoo user, the Torch handles Exchange, POP3 and IMAP4 accounts with ease. Users can add up to 10 different email accounts to the Torch. It carries over many of the touch-based email behavior seen on the Storm devices. It can display HTML email, but the phone is fussy about downloading images for those emails. It sort of negates the point if you have to always request that the images be loaded. HTML emails also get in the way of swiping behavior. For example, with the Storm/Storm2 swiping left or right takes you to the previous or next email. With the Torch, you end up panning around an HTML email when you swipe left or right rather than advancing to the next email. Regular emails don't have this problem on the Torch. Despite some of these navigation niggles, the Torch's email experience is mostly good. Options abound, and there are simple touch controls to perform actions such as replying, forwarding, and so on. 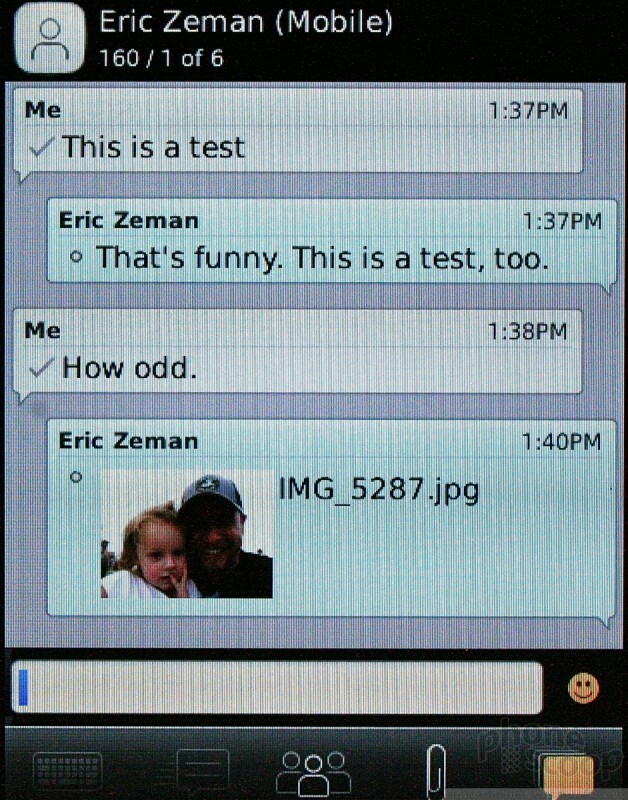 The SMS/MMS client has been updated a bit and now offers better threaded messaging. Messages are called out in text bubbles that help to visually separate the different sides of the conversation. Adding any sort of media to outgoing messages is a breeze. Content is nicely embedded in the text bubbles. 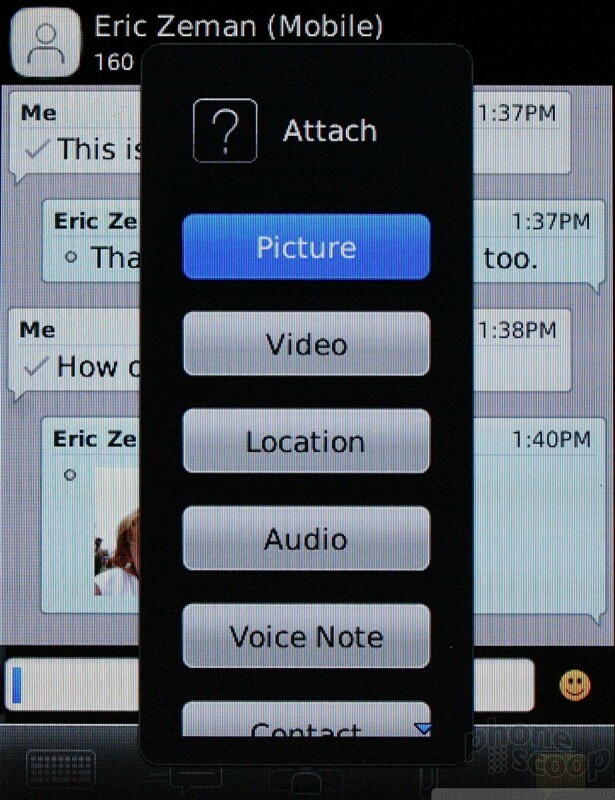 BlackBerry Messenger is on board, of course, to allow for PIN-based messaging. 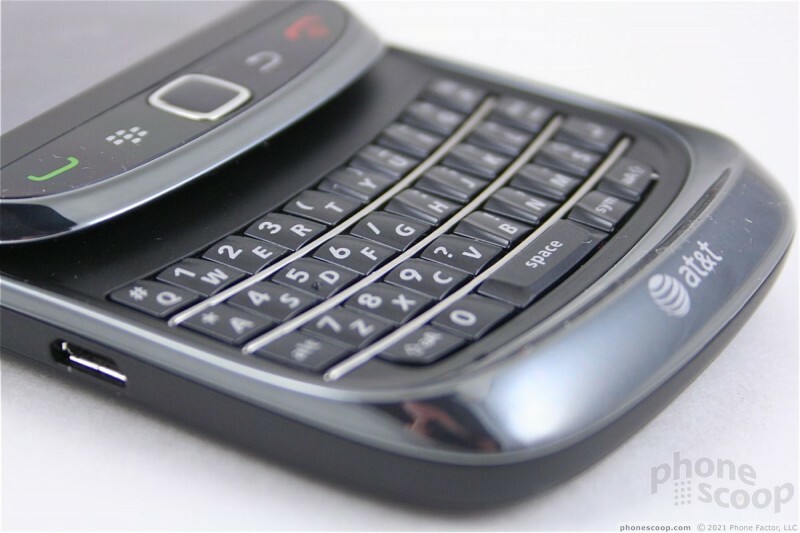 Users of BBM will be pleased enough with the the current version of BBM on board the Torch, which isn't much changed when compared to what's already available on existing BlackBerry handsets. Using BBM lets users avoid SMS charges and offers tools such as received/read receipts. 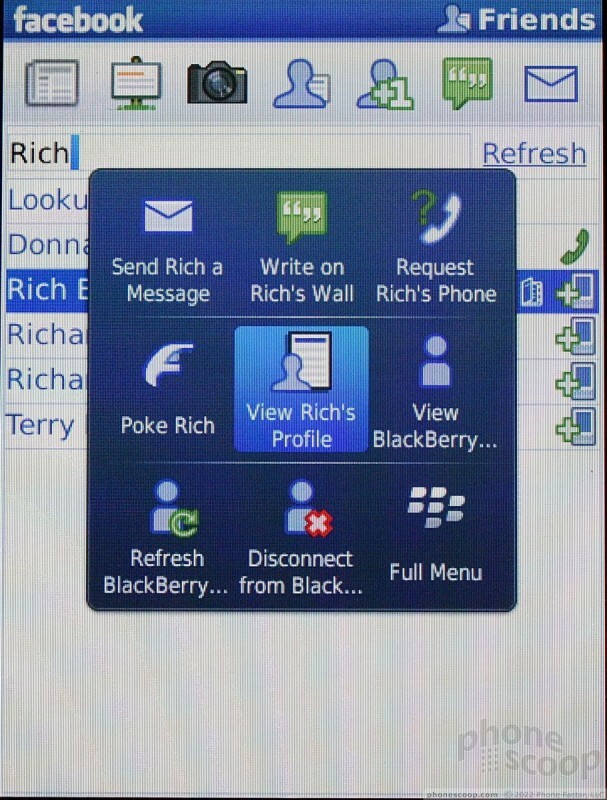 If BBM isn't your thing, the Torch also offers Yahoo Messenger, AIM, Windows Live, and Google Talk IM clients. 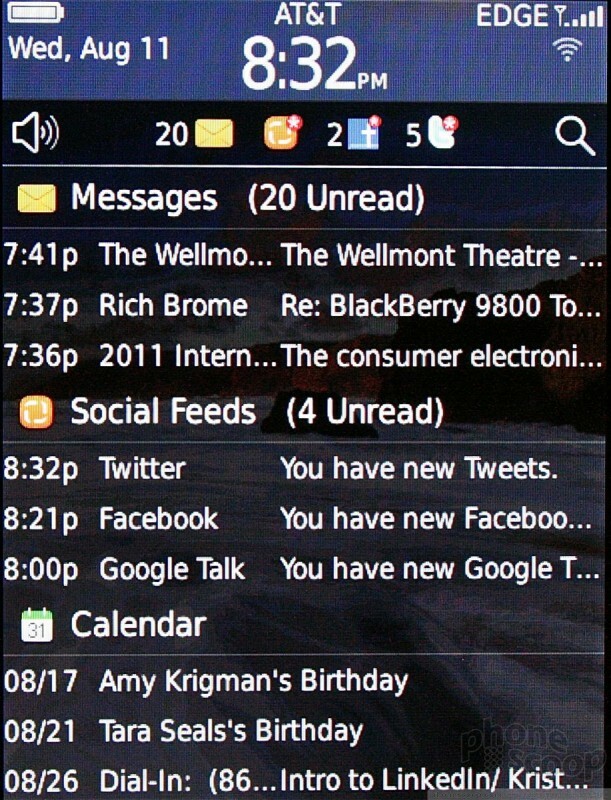 All of these messaging services (and social networking, too) are wrapped together in a master inbox and the notification bar. While useful, both can be overwhelming. Some people may want to exclude their Twitter @replies from their main inbox. I know I would. Same goes for some Facebook messages. You can, if you wish, hide the entire master inbox and retrieve messages each from its own account inbox. If you have multiple email accounts, Twitter accounts, Facebook, and so on, arranging all these into a usable stream takes patience. I'd rather see the social networking apps pulled out of the master inbox and aggregated in their own spot. 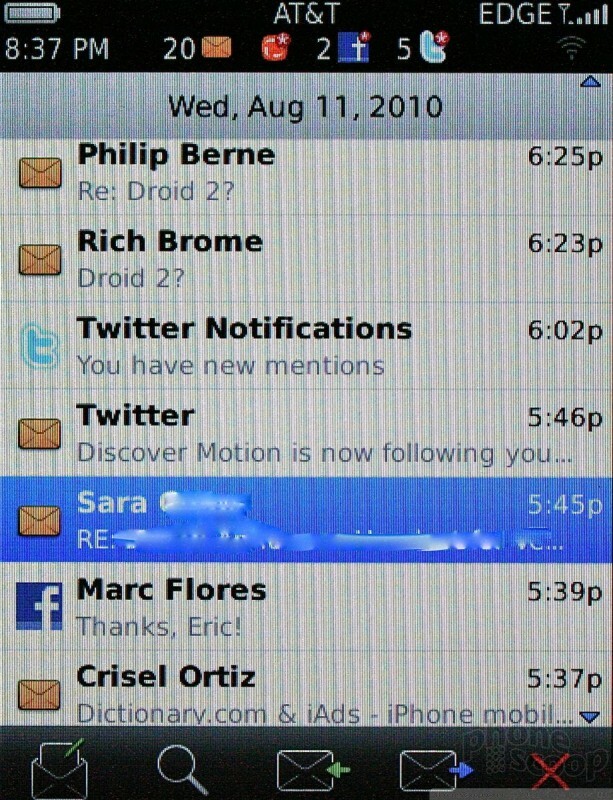 The notification bar found on the home screen lets users preview any of the messages listed here without opening the associated messaging application. The Torch comes with official Facebook, MySpace and Twitter applications pre-installed. Each works well enough of its own accord to keep users in touch with their circles of friends, family and colleagues. 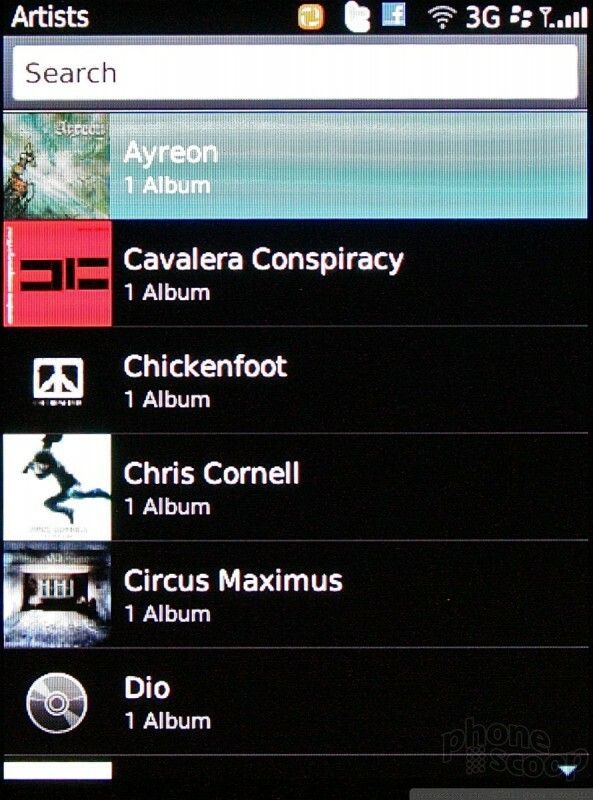 RIM and the developers of these apps have done a decent job of integrating them across other parts of the Torch. 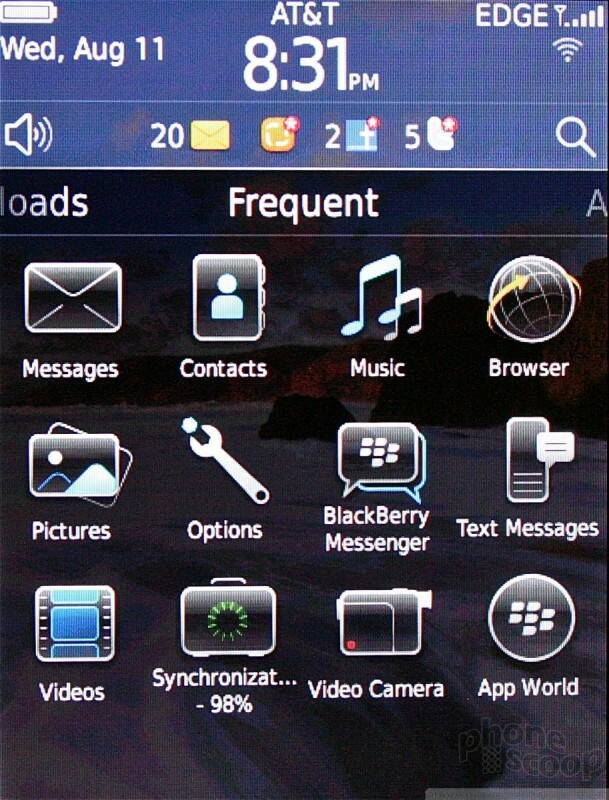 For example, all the social networks report new messages to the notification feature of BB6, which displays the number of unread messages at the top of the home screen. 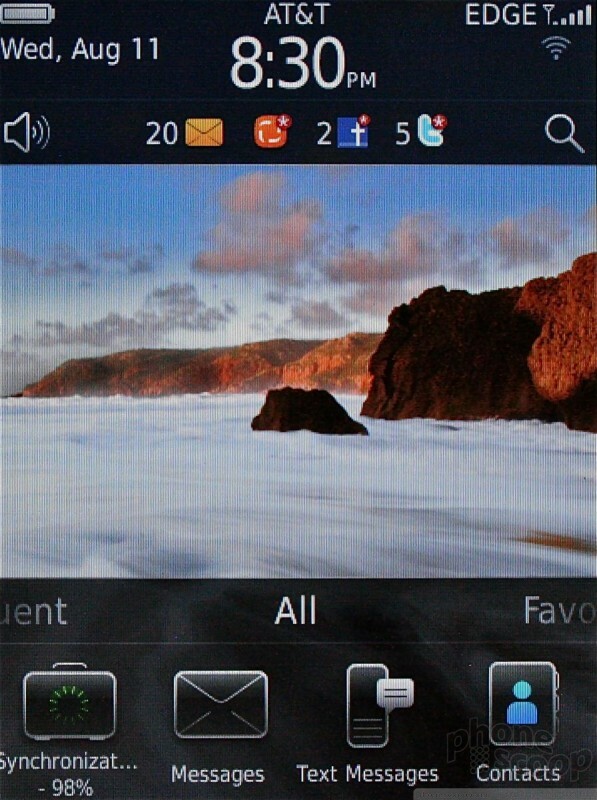 The social networking apps are also integrated into the contact app and messaging functions. Need to call a Facebook friend, but don't have their number in your BlackBerry contacts? No problem-o. The number is available in the Facebook app (if the person has put it there). If you don't like these options, the mobile web sites are always available, and there are numerous Twitter clients for the BlackBerry platform that can be used, rather than the first party one. There is also a Social Feeds application that streams status updates and posts from Facebook, Twitter, MySpace, and user-defined RSS feeds. If you'd like to consume all your social networking in one spot, this app lets you do it. It's not the most robust app I've seen, but since the native apps are already on board, it feels a bit unnecessary to me. 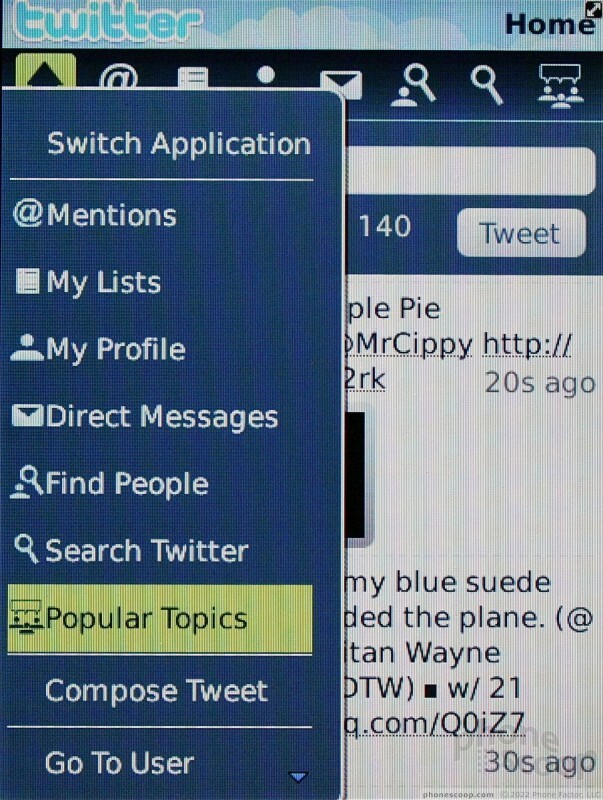 In sum, the Torch easily handles the social networking basics, as BlackBerries have for a while now. The BlackBerry camera software continues to be fairly basic. Leaving the side convenience key set to launch the camera is the best and fastest way to get at it. It launches in perhaps a second or so. The Torch has a 5 megapixel camera with autofocus and an LED flash. The autofocus is set to work continuously. There is no focusing box that appears and turns green when the camera is ready. According to RIM, the Torch is always focusing as the camera is moved around. It can also be turned off (effectively setting the Torch to fixed-focus mode) or set to single-shot mode, which means it will only work once, then revert to continuous autofocus. My guess is this choice is going to confuse most people, leading them to ignore the feature. 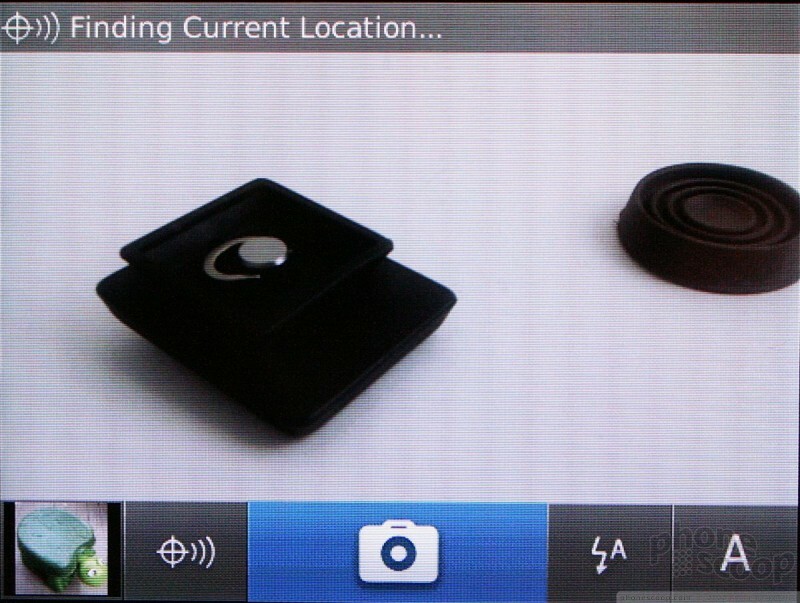 The physical button can be used to focus and take pictures, as can a software button on the Torch's display. 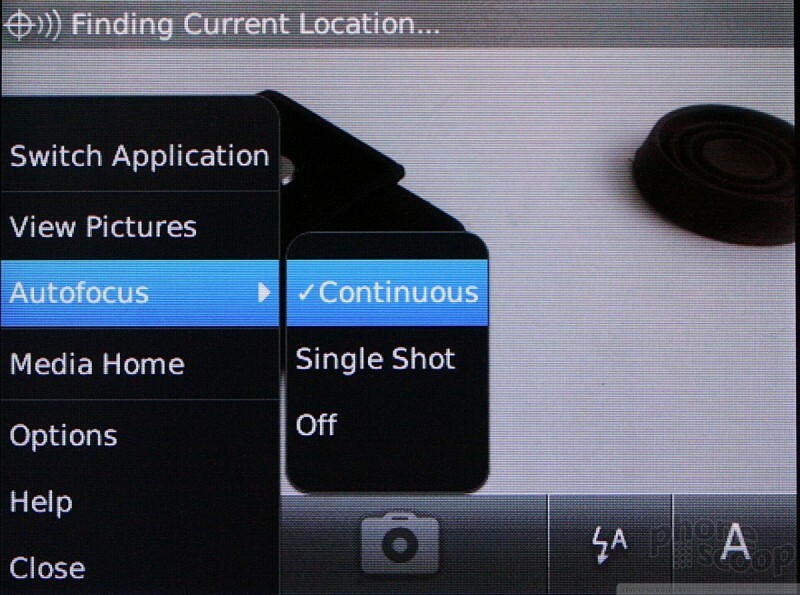 Some basic options can be controlled from the viewfinder without calling up a separate menu. The flash can be turned off, on or set to auto. The geo-tagging can be turned on or of. 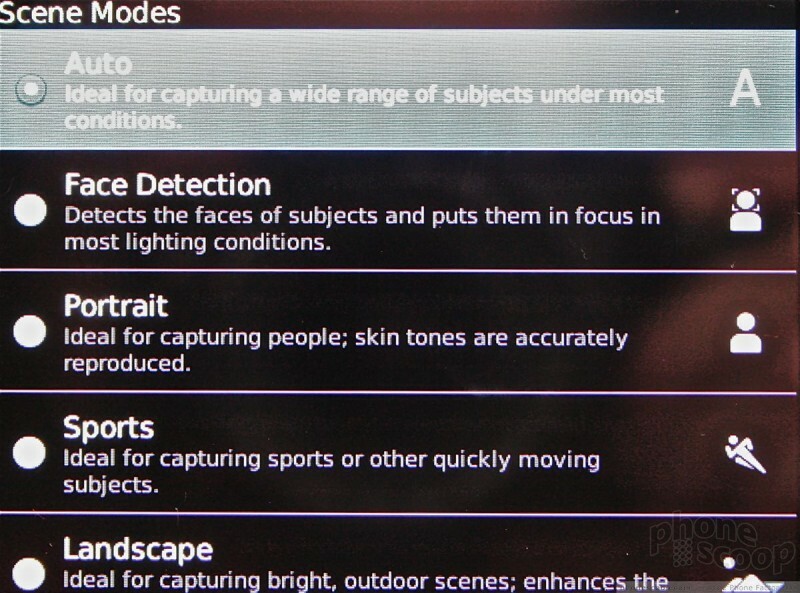 And the shooting mode can be changed, which includes a wide list of options (auto, face detection, portrait, sports, landscape, party (my FAVE! ), close-up, snow, beach, night, and text). 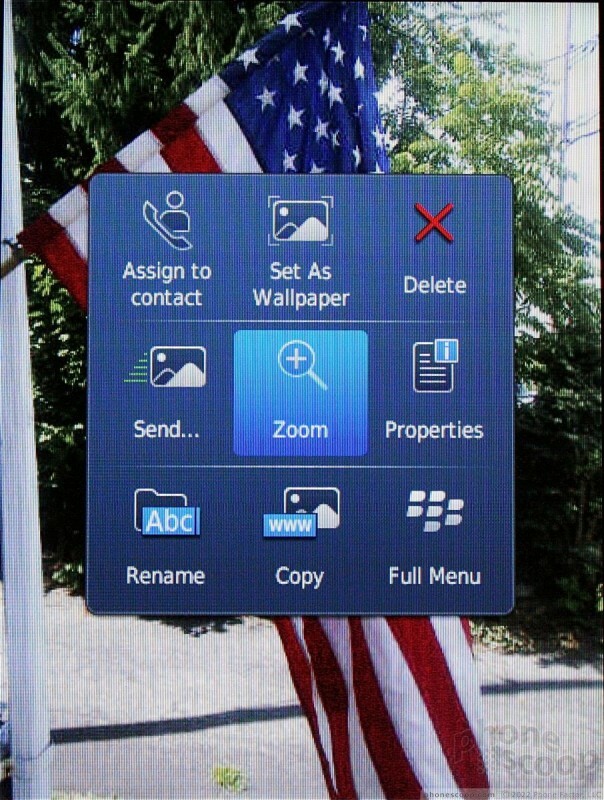 The BlackBerry key can be used to get at several other settings, such as resolution, where pictures are stored, etc. When you want to take a picture, the Torch responds pretty quickly. 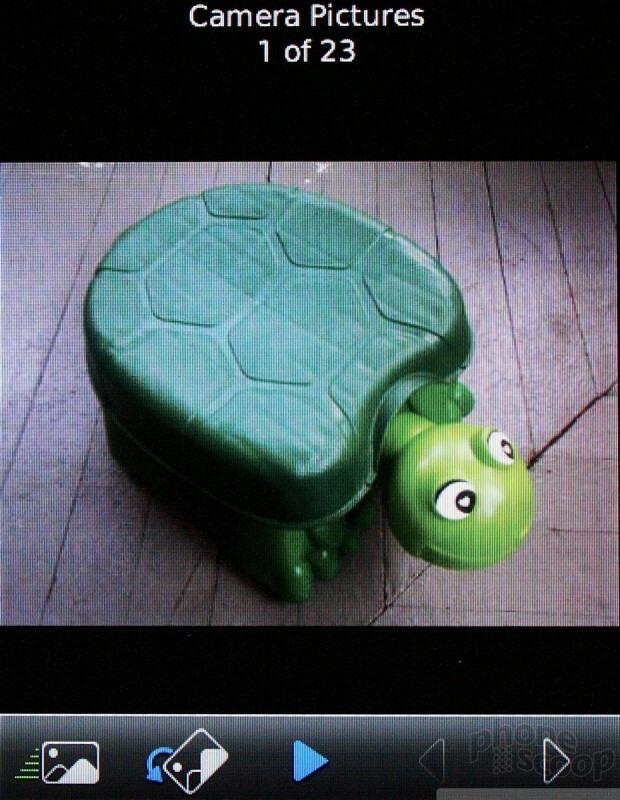 It shoots and saves pictures in 1.0 - 1.5 seconds, which is about the best you can expect from a phone. The video camera's controls are pretty much identical. One thing I like about the Torch's camera is that it puts a thumbnail of the most recent shot in the corner of the viewfinder. This means you can see the picture you last shot. Press it, and it opens the gallery application. The Torch's gallery app has been redone and is much, much better than what RIM has offered in the past. 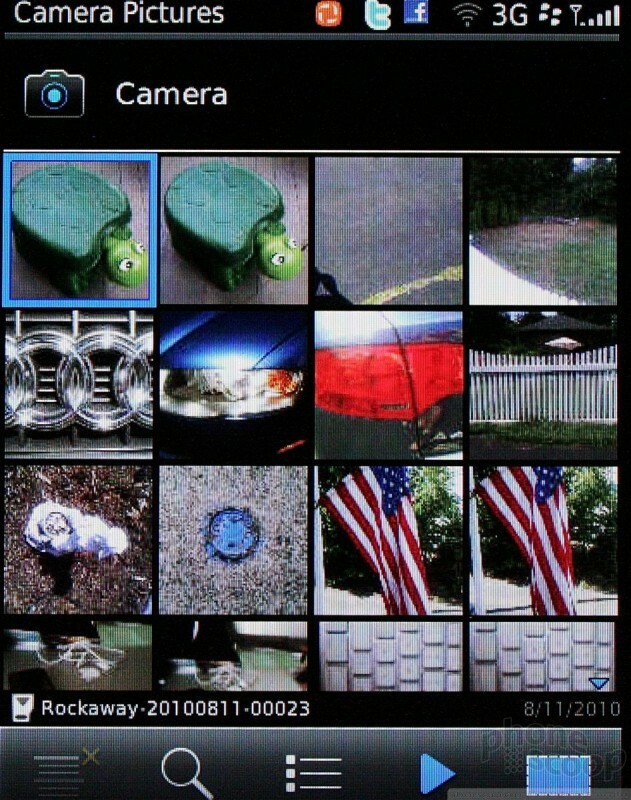 Pictures can be viewed as a list, or in a grid. From the main gallery view, pictures can be selected, moved, shared, edited, and all that you expect. Once you open a picture, you can skate through the entire gallery by swiping in either direction. Editing features are limited to rotating. 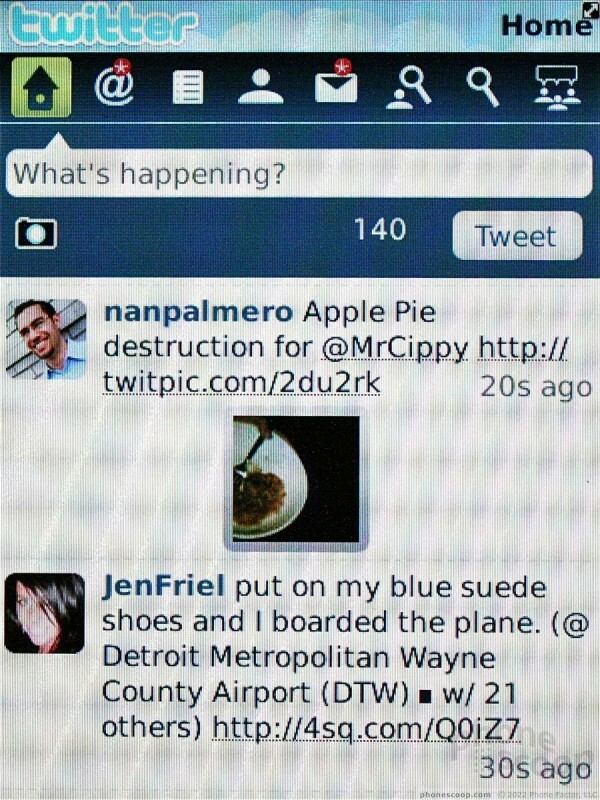 Pictures can be shared via email, MMS, Bluetooth, Twitter, GoogleTalk or Facebook. 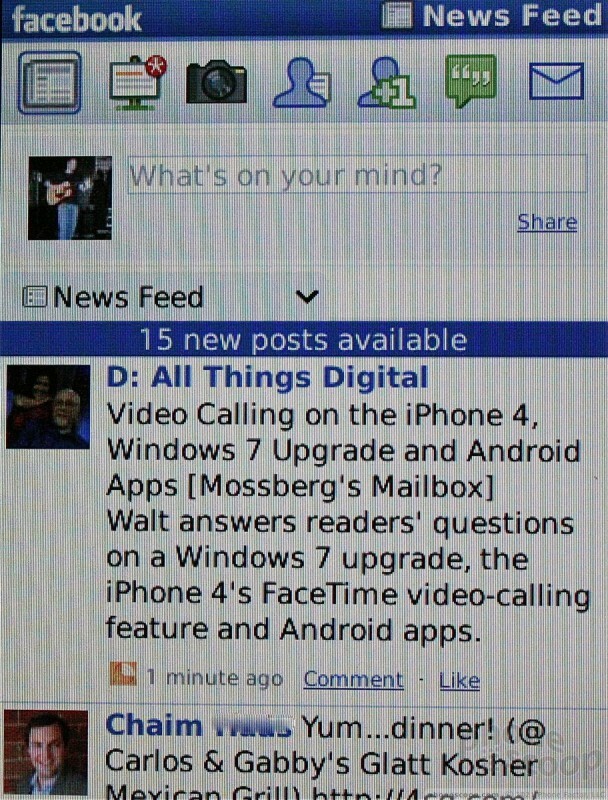 That's some nice social networking integration. I would have preferred to see some more editing features built into the gallery app. You can zoom, but not crop? 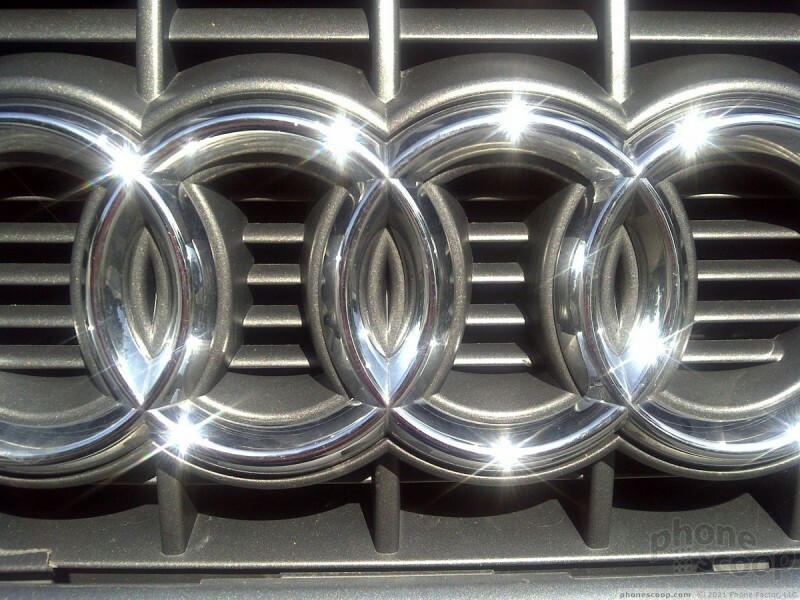 With a 5-megapixel camera and flash, you might be fooled into thinking that the Torch has a good camera. You'd be mostly right. The Torch handles aspects such as white balance, color representation, and exposure as well as any other cameraphone. Images had vibrant and rich colors, and the Torch appropriately accounted to whatever type of lighting was available. It had some problems here and there, with whites being blown out a few times, but mostly it did OK. The real problem, in my book, is the presence of grain. Even those images which appear to be perfectly in focus in well-lit areas had grain or some digital noise. This is a shame, as it really holds the Torch back a bit. 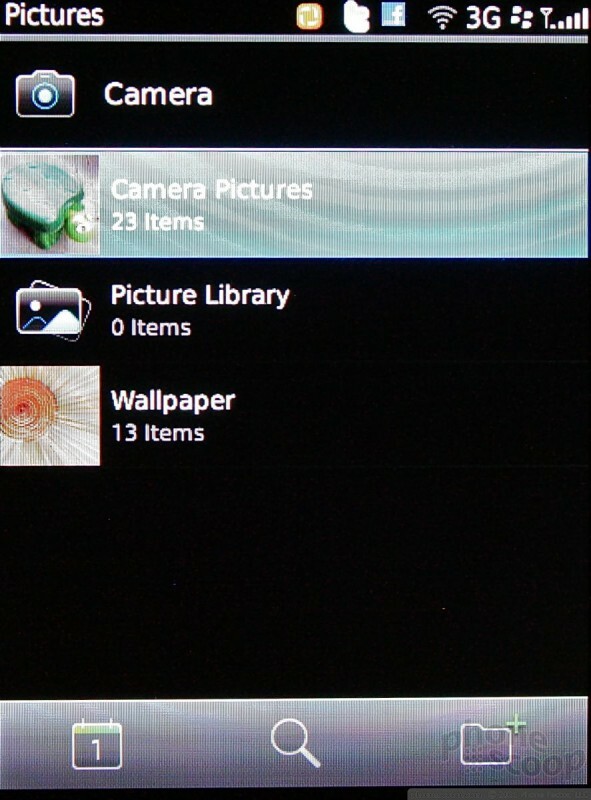 Still, my guess is the average user will be mostly pleased with the Torch's photo capabilities. More advanced users will have better results if they make use of the extensive shooting modes, and take care to use the flash appropriately. 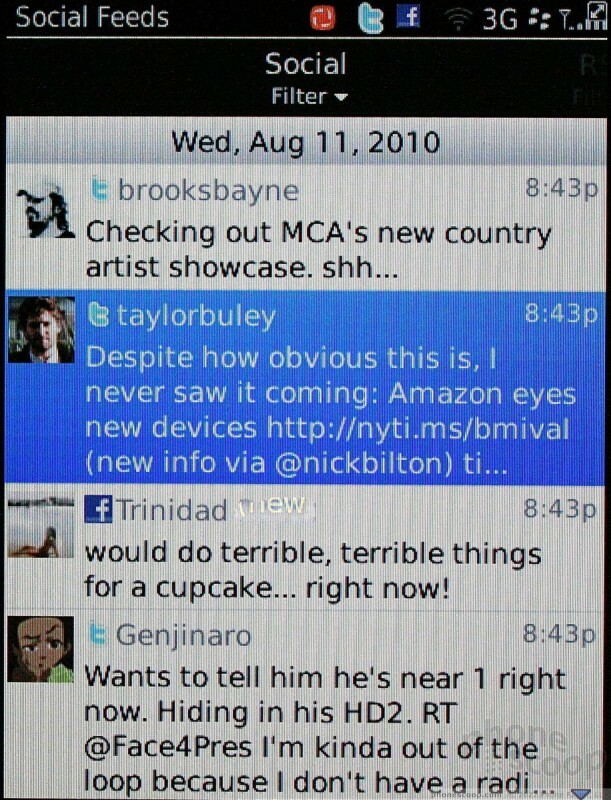 I would have no qualms about sharing photos captured with the Torch via email, Facebook, Flickr, etc. As with the pictures, color, exposure, and white balance is pretty much spot-on with the Torch's video capturing capability. The one bummer is that motion isn't smooth. You'll notice that as I pan back and forth (slowly, I might ad), there's some herky-jerky stuttering. Other than that, the Torch did a fairly good job. 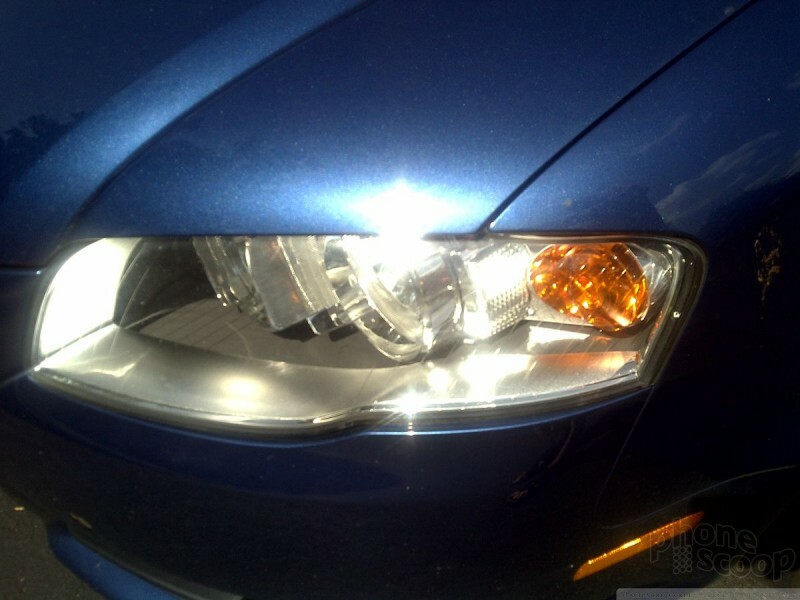 It even reacted well to a drastic change in light. The videos captured with the Torch will certainly be Facebook and maybe even YouTube worthy. 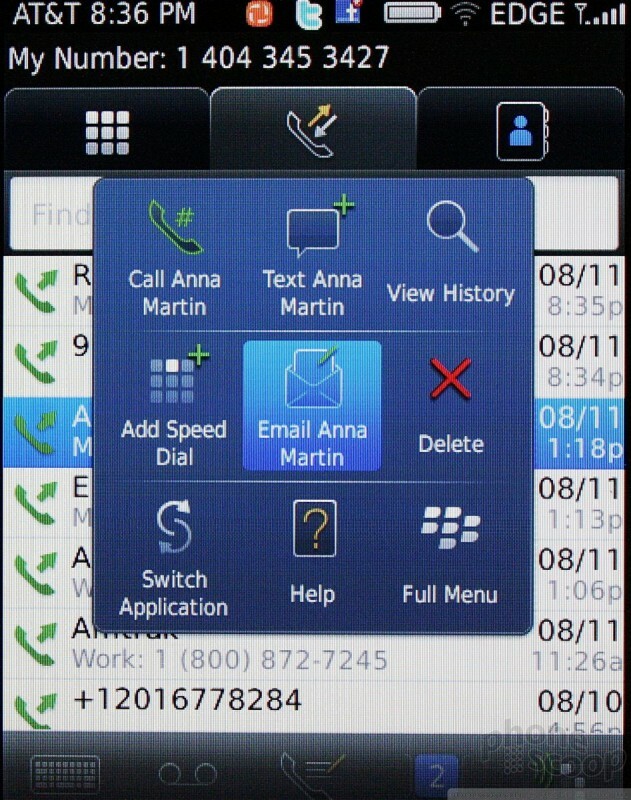 One of BlackBerry 6's biggest features is the entirely new WebKit-based browser. WebKit is the same underlying technology used in the Safari browser on the iPhone and the Android Browser on Android handsets. It makes a noticeable impact on the Torch. 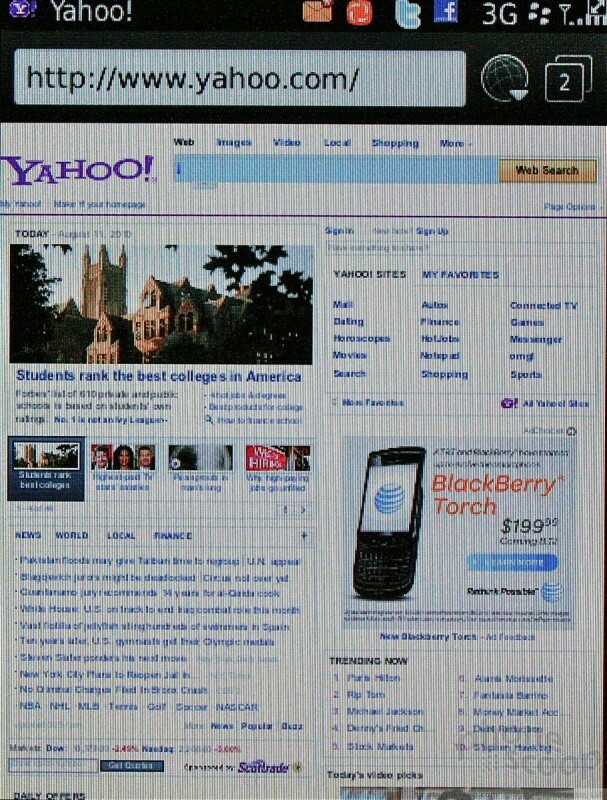 RIM hasn't done too much to the way the browser is used. 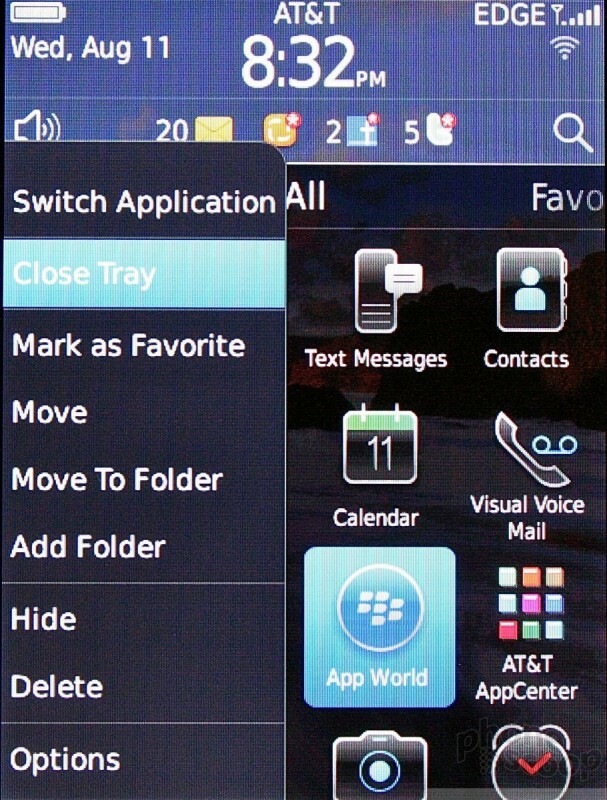 In other words, the options and BlackBerry key work as on older BlackBerries. Users can set the home page, set the default search engine, add/sort bookmarks, subscribe to RSS feeds and so on. The browser does a much better job at rendering HTML web sites, though. It supports double-tap, pinch-to-zoom, and press-and-hold gestures, which vastly improves the experience and puts it in the same playing field as the iPhone and Android browsers. It supports multiple open tabs at a time. 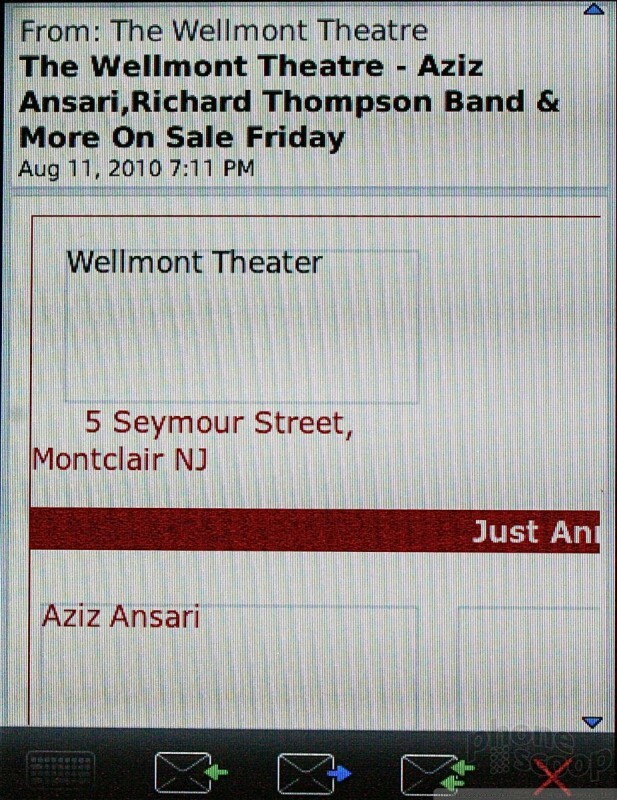 The tabs can be accessed by pressing a little button in the upper right corner of the browser window. The tabs are shown in a visual bookmark fashion, making it easier to see which site you're jumping too. My only complaint with the browser is speed. 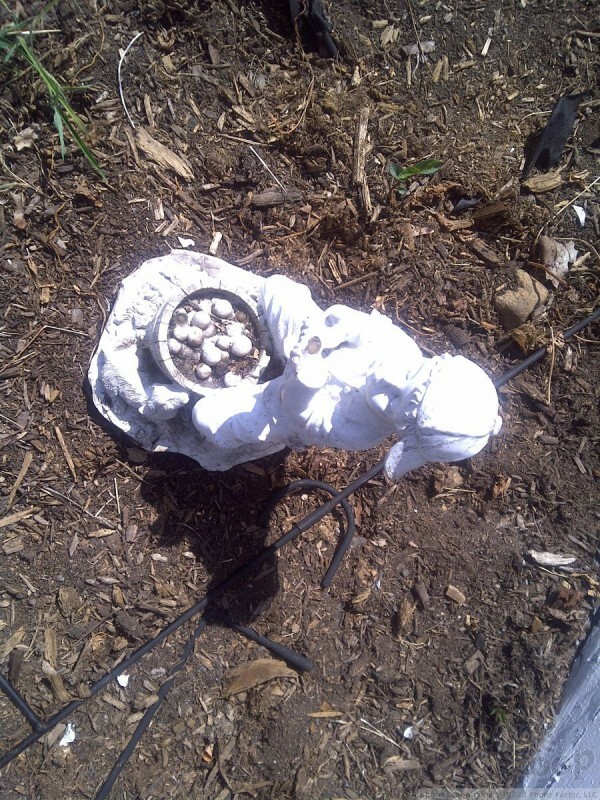 It felt a bit sluggish to me. Even over speedy Wi-Fi, web sites often took 10 seconds or longer to load. 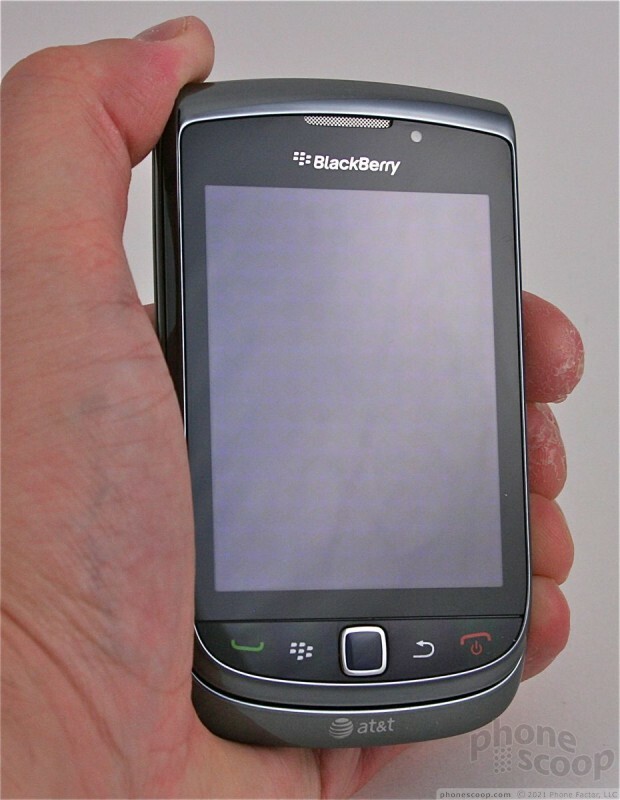 I think most seasoned BlackBerry users, however, will trade a teensy bit of speed for all the added functionality. The Torch can be customized somewhat by users. 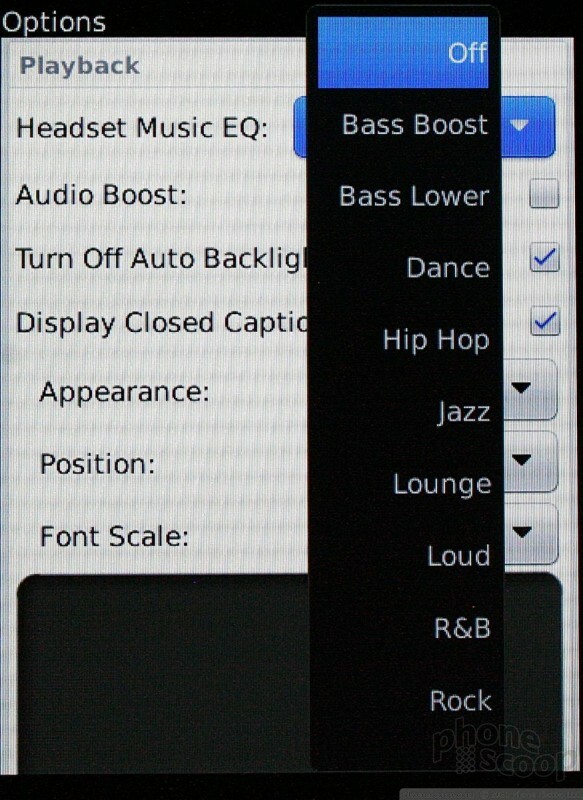 Ringers, ringtones, wallpapers, and all that stuff is easy to adjust. 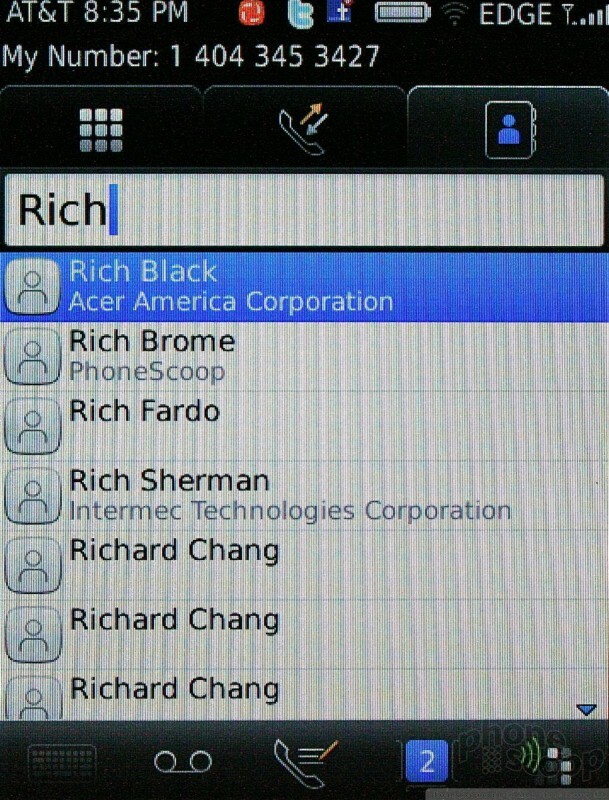 RIM's use of ringer profiles is always helpful. It allows users to set up distinct alert actions depending on pre-defined circumstances (Normal, Silent, Meeting, etc.). The basic theme of the device, which I can't stand, can't be changed unless users download extra themes. Only one theme is included out of the box. 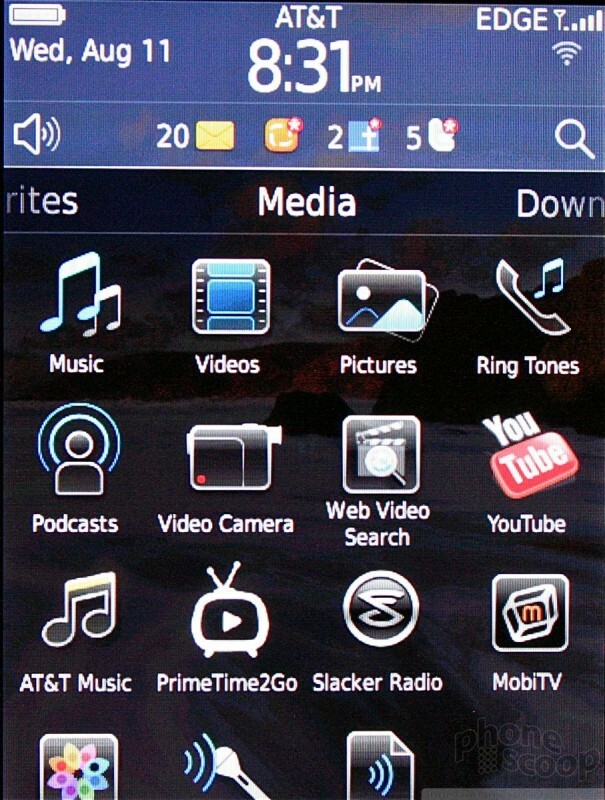 BlackBerry themes can be found online, both free, and for a few dollars. The home screen can also be customized to a certain extent. It's not as vastly customizable as an Android handset, but users can populate the five different screens with a number of apps, shortcuts, and so on. According to RIM, more HTML5 and WebKit-based widgets are on the way, which will further allow users to customize their handsets. 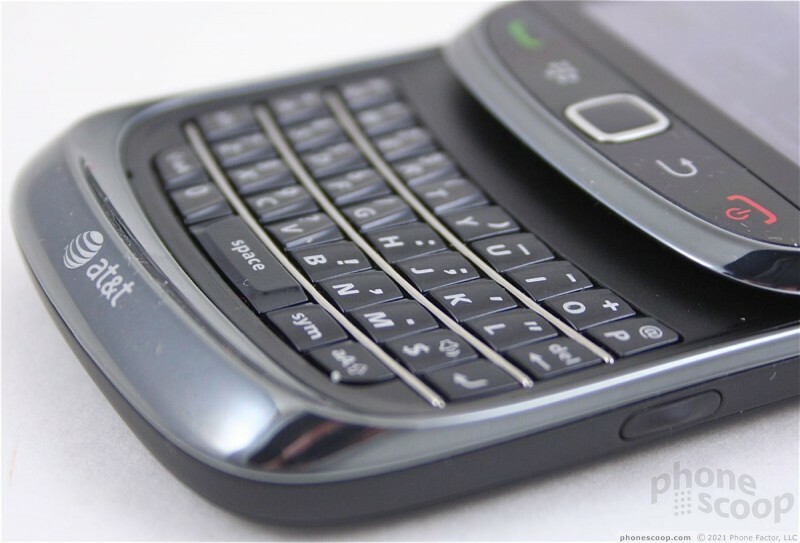 BlackBerry App World has been updated to version 2.0 on the BlackBerry 9800 Torch. What's different? Not a whole lot at first glance. 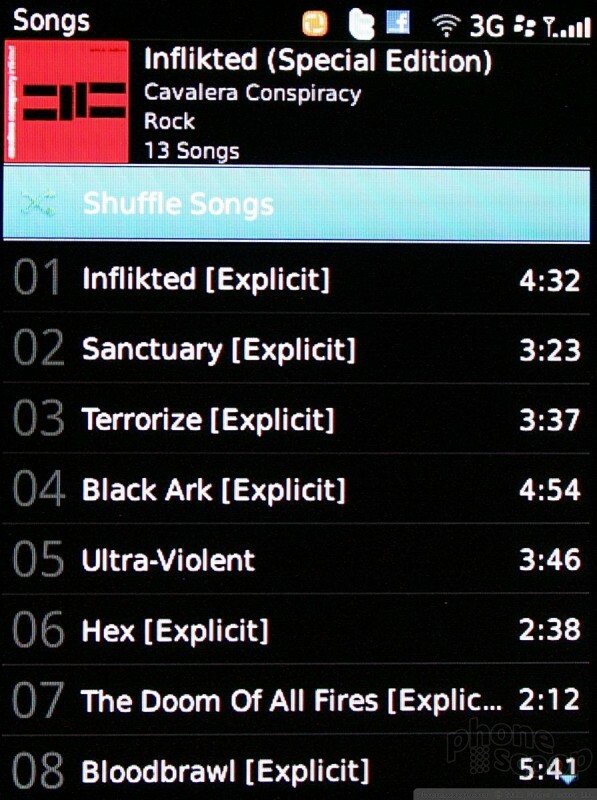 Basic navigation of the store remains the same, with featured apps front-and-center, and access to categories and top 25 lists buried in the options menu. The biggest improvement is support for carrier billing. This means AT&T customers will be able to purchase apps from App World and have the charges applied to their monthly wireless bill. App World is still sparsely populated when compared to the Apple App Store and the Android Market, but it is much better off than Palm's App Catalog or the Windows Marketplace. There are thousands of applications available for download, including many of the must-have apps such as Pandora, etc. There is also a ridiculous AT&T AppCenter on board the Torch. This app store, which itself must first be installed, offers users access to insanely over-priced wallpapers, ringtones, and so on. The Bluetooth functions of the Torch worked perfectly. Pairing with headsets, speakers, other phones and PCs was a snap. Call quality through mono Bluetooth headsets was a little bit iffy, but bearable. Quality of music through stereo Bluetooth speakers was pretty solid. Passing files back and forth between other handsets or computers was not a problem. The BlackBerry clock application doesn't appear to be changed. The 9800 has a really nice analog clock that takes up nearly the entire screen if you want it to. Too bad that's not the default screen when the device is sleeping. You have to manually select the clock to see it. If the device falls asleep when the clock is open, you'll see the time nice and big when you wake the 9800 up. During most regular use, you're stuck with the smaller digital read-out that's at the top of the screen. In other words, it's a pain to check the time on the fly. Alternately, you can set the Torch in "bedside mode". This essentially assumes that you're going to place the Torch on a nightstand within arm's reach when you're in bed. It will show the clock and let you interact with the alarm. Bedside mode can also be activated when the Torch is charging, which means the clock is visible any time the Torch is plugged in. The Torch is pre-loaded with AT&T's $10/month navigation service. 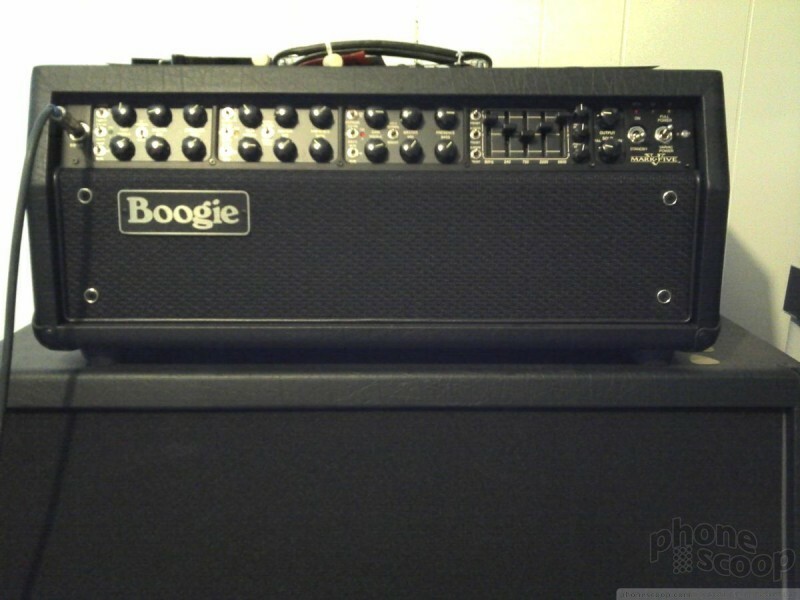 It offers voice-guided turn by turn directions, and does a good job at it. If you're cheap like me and don't want to give AT&T another $10 per month, you can stick with Google's free Maps for Mobile. Google Maps for BlackBerry, however, doesn't offer voice guidance or turn-by-turn directions. It will provide directions from point A to point B, but only in list form. It is capable, however, and works well. 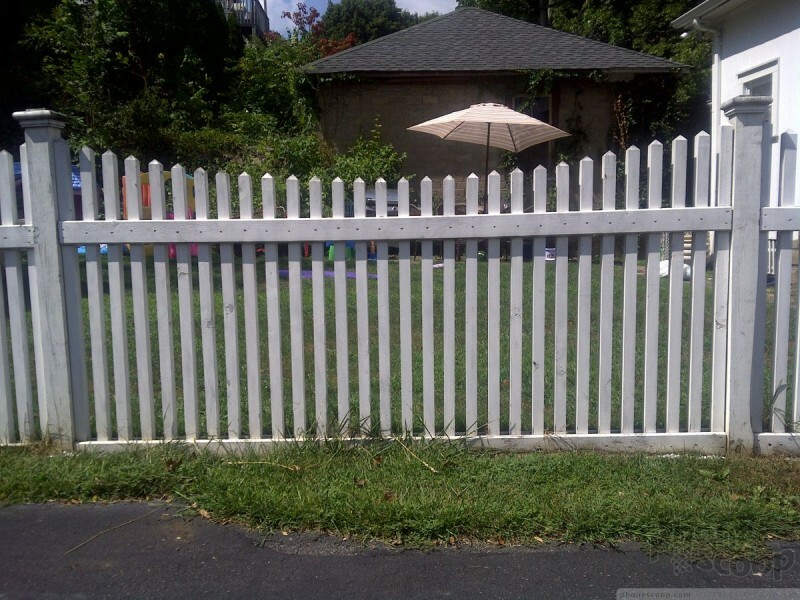 Google Maps also works as a good search tool if you want to find stuff nearby. 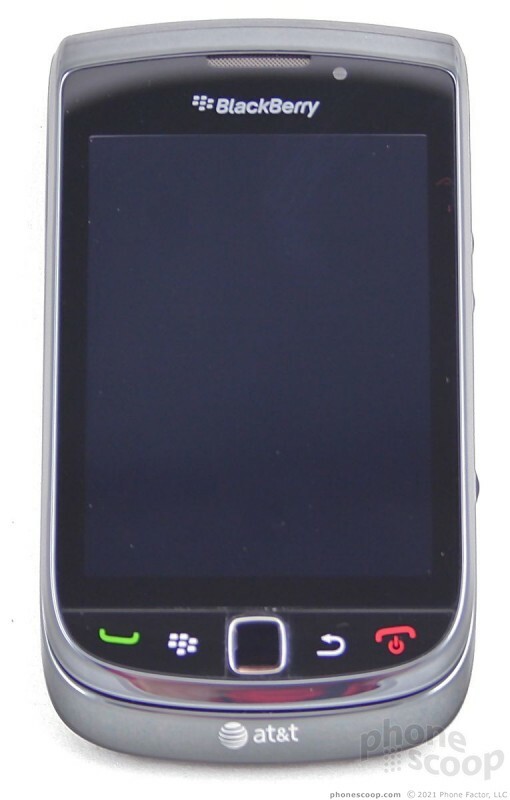 The BlackBerry 9800 Torch with BlackBerry OS 6 and the new WebKit browser on board together make for the best BlackBerry yet. 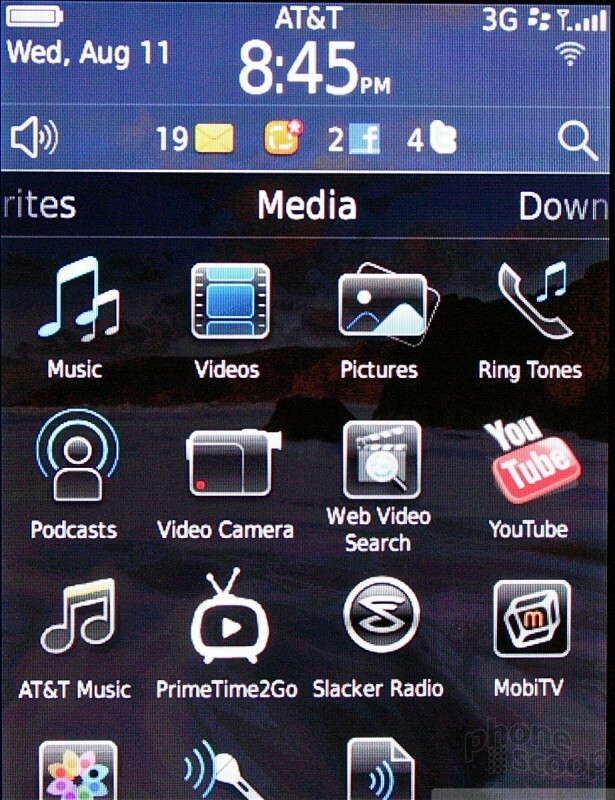 BlackBerry OS 6, in particular, pushes the Blackberry platform back into the fray with Apple and Google. But I'm not sure BlackBerry OS 6 has much of a fighting chance. RIM is historically slow to upgrade its hardware and services, as it can't alienate its business user base. That is evident in its "fresh but familiar" pitch of BlackBerry 6. RIM changed *just enough* about the user interface to make it a more competitive product, but didn't go with a clean-sheet design and start anew. 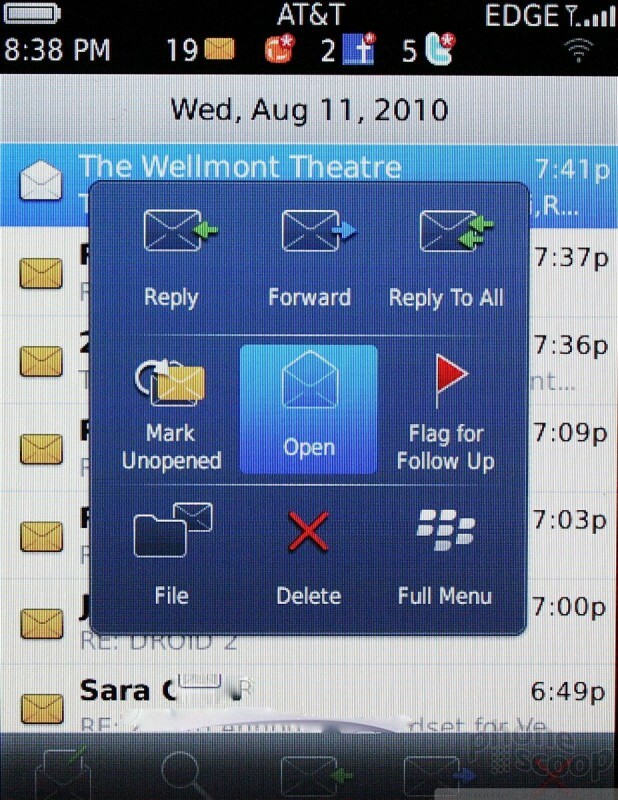 BlackBerry OS 6's strengths include the improved home screen, messaging notification bar, improved media software, vastly improved browser, better social network integration, and future support for Web-based apps. RIM did a good job of working touch-based controls into the behavior of the Torch. We can't leave out the weaknesses, however. The email program, while powerful and feature-rich, still doesn't have the pop or pizazz that some of the competition offers. In my opinion, there's too much familiar, and not enough fresh when it comes to the overall look and feel of the icons, menus, and systems. The browser is more powerful, but felt sluggish an unresponsive at times. Beyond the software, the Torch 9800 itself isn't a home run. 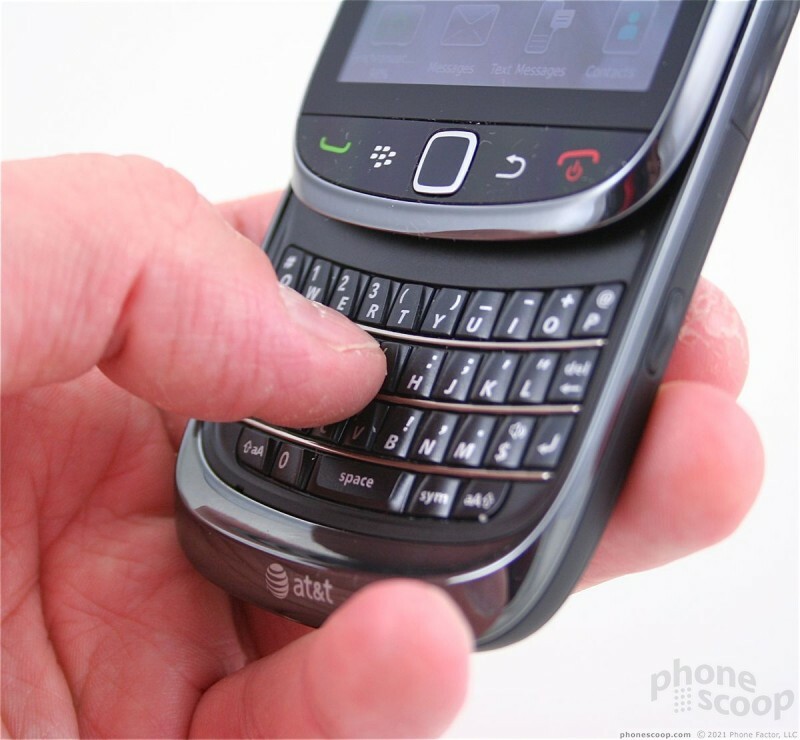 The odd marriage of touch phone with the slider-QWERTY may not appeal to some, despite the extra functionality. Battery life was acceptable, but call quality was surprisingly weak. The Torch's display also fails to light my fire, especially in the light cast by competing handsets such as the Droid X and Galaxy S devices. 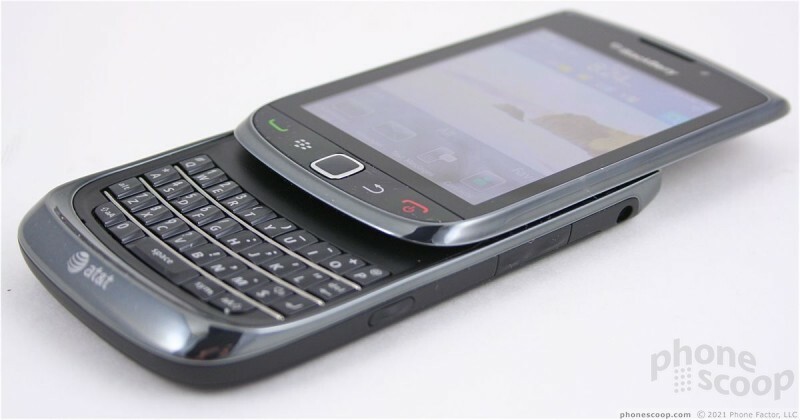 If you're an AT&T customer who happens to be a BlackBerry aficionado, the Torch is a no brainer. Go out and get it tomorrow. If you're an Android or iPhone lover, you'd best check the Torch out before buying. 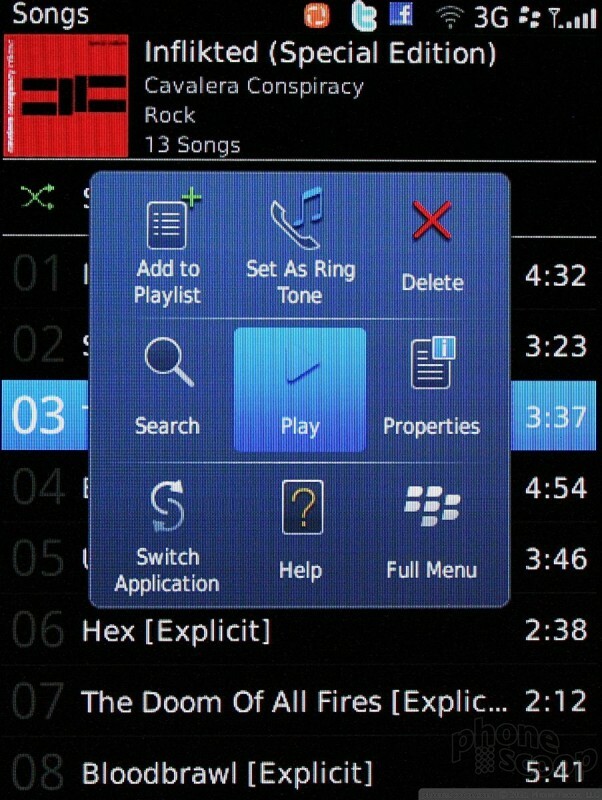 If you're a BlackBerry user on any other network, I'd recommend waiting a bit to see what else RIM conjures up for the carrier of your choice.